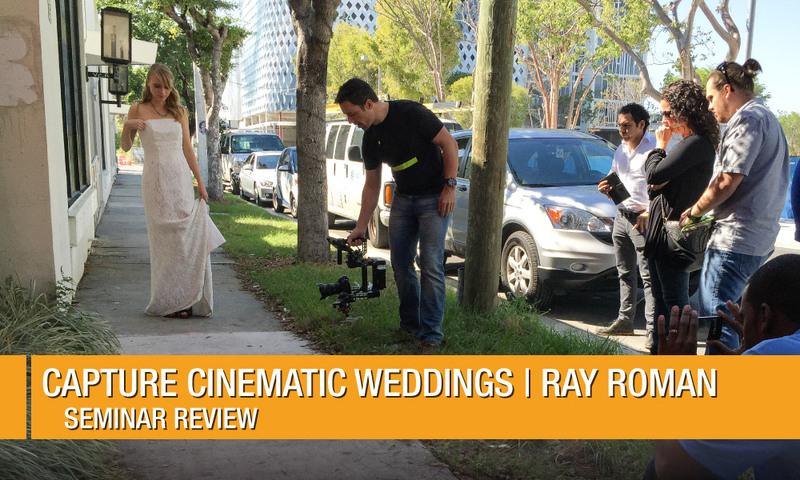 A few weeks ago, I had the pleasure of attending Capture Cinematic Weddings with Ray Roman in Fort Lauderdale. The in-depth seminar took place at a hotel just steps from the beach. We learned how to maximize picture quality with proper exposure settings, understanding how to master the speeches and get perfect audio every time, and how to price & position our work to gain high-profile clients. It was great watching some of Rays favorite wedding films to help illustrate everything we were learning. The next day, Rays master class put everything we learned in the classroom into practice. Watching Ray shoot was a real treat. Hed show us how-to lighting for bridal prep, then explain how he frames his shots to maximize the amount of content you can capture in a short amount of time. After bridal prep, Ray took us through the first look. He explained his 2-3 camera setup and how to rely on unmanned cameras for more coverage. He broke out the DJI Ronin and created a few dramatic shots of the model walking. After we watched him work, the attendees got a chance to command the set and try a few shots while being coached along by Ray. I enjoyed the workshop. Not only do you get a chance to learn from the best, but you can watch Ray work and ask questions. He gave great feedback once he handed the camera to the attendees to shoot. From there, we went through a typical ceremony. It was great watching Ray set up lights, taking what would have been unusable footage and making it look amazing. We went over camera placement, where at least one camera always has a shot, making the edit so much easier. In the studio, we went through an edit and went over tips for editing and assembling clips. Ray talked about sound and time-shifting using the speeches to carry the viewer through the video. Once the edit was complete, we went through adding the finishing touches by applying a look to the video and adding sharpness. The in-depth seminar and master class don’t have to be taken together. I opted to take both classes because I love Rays work and wanted a chance to spend some time with him. Some of the topics are covered both days for people who only attend one or the other. The best part about attending both was learning everything the first day, then putting it into practice during the master class. Overall, Ray and his team produced a terrific workshop covering everything youd expect when shooting a wedding. I always love to hear stories from the set and Ray sure had a bunch. Theres nothing worse than all the lights going off minutes before the bride is set to walk down the aisle. I highly encourage you to check out his workshops at http://capturecinematicweddings.com/. If you’d like to attend, you can use the code PHOTOFOCUS for discounted tickets.